The I-496 and US-127 interchange is one of the most dangerous roadways for auto accidents in the Lansing, Michigan area. This interchange, where the two major highways come together for a three-mile stretch, was the site of 129 motor vehicle crashes in 2015. The I-496 and US-127 area is dangerous for several reasons, including heavy traffic, especially in the morning and early evening hours. In addition, the roadway has multiple entrance and exit ramps, and drivers are confronted with shifting traffic patterns and numerous lane mergers. 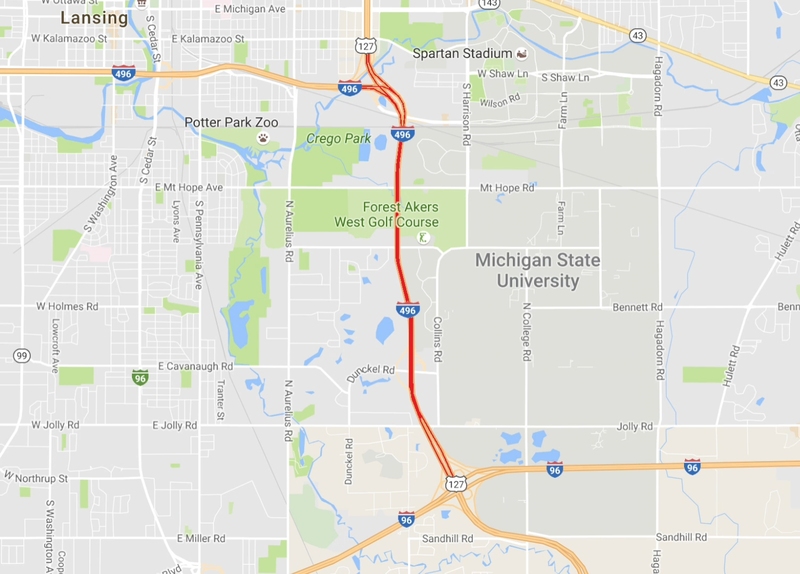 The most risky areas of the interchange are just north of the Jolly Road Exit, where I-496 and US-127 branch off around the downtown Lansing area. 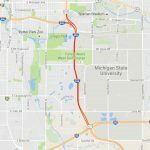 As part of the Sinas Dramis Law Firm’s Understanding Dangerous Roads campaign, Lansing attorney Stephen Sinas pinpoints Michigan dangerous roads, including four areas along the I-496 and US-127 corridor in Lansing, Michigan. Video footage of the interchange was taken to help people better understand the dangers surrounding these four areas, where the risk for a Lansing auto accident is especially high. In the video, Stephen discusses the four problem areas and explains the specific dangers that each area presents. In 2015, there were 22 crashes on the Trowbridge Road exit on southbound US-127. This area is dangerous because the Trowbridge Road exit ramp shares a lane with the entrance ramp onto US-127 from Kalamazoo Street. As a result, there are many vehicles shifting lanes while traveling close together at varying speeds. There were 51 crashes last year in the area where eastbound I-496 merges into southbound US-127. This area is dangerous because it is a curved roadway where several lane mergers take place, as the two major highways are funneled together into a two-lane roadway. As a result, drivers can be confronted with heavy traffic, become confused about how the lanes merge, or become impatient and try to make dangerous lane changes. Ultimately, this is the most dangerous part of the interchange, which means drivers should be extra cautious in this area. In 2015, there were 34 crashes around the Trowbridge Road exit on northbound US-127. This exit is dangerous because it requires drivers to abruptly slow down to 25 mph in order to safely navigate the very sharp turn on the exit. In addition, the slowing of vehicles on this exit can back up other traffic on the interchange. There were 22 crashes in 2015 in the area where eastbound I-496 merges into northbound US-127. This area is dangerous because the eastbound I-496 lane has an abrupt curve, just before merging into the same lane that motorists on northbound US-127 use to access the Saginaw Highway exit near the Frandor Shopping Center. Most crashes in this area are associated with drivers switching lanes without making sure it is safe to do so. Be aware of the existing dangers, including merging lanes and heavy traffic patterns. Share this awareness with your family and friends. Take extra precaution when traveling through the area. Do not get distracted while driving (for example, do not use a cell phone) and stay focused on the road. If you’ve been injured in a Michigan car accident or have questions, contact one of the experienced accident attorneys at the Sinas Dramis Law Firm. Or call us at 866-758-0031.